Boris Vasilievich Spassky (also Spasski) (Бори́с Васи́льевич Спа́сский) (born January 30, 1937) is a French (formerly Russian or Soviet) chess player and former world champion. He was born in Leningrad to a Jewish mother and learned to play chess at the age of five. At age 18 he won the World Junior Chess Championship held at Antwerp, Belgium, and became a grandmaster. Spassky was considered an all-rounder on the chess board, and his "universal style" became a distinct advantage in beating many top Grandmasters. For instance, in his Candidates Final match (the match which determines who will challenge the reigning world champion for the title) against Mikhail Tal the legendary tactician, (Tbilisi, 1965) Spassky managed to steer play into quiet positions, avoiding Tal�s tactical strength. This led to his first World Champion match against Tigran Petrosian in 1966. Spassky lost the match by one point, but earned the right to challenge Petrosian again three years later. Again, Spassky�s flexibility of style was the key to his eventual victory over Petrosian by two points in the 1969 World Championship—by adopting Petrosian�s negative style. Spassky�s reign as a world champion only lasted for three years, as he lost to Bobby Fischer of the United States in 1972 in the "Match of the Century". The contest took place in Reykjav�k, Iceland, at the height of the Cold War and consequently was seen as symbolic of the political confrontation. Fischer won and Spassky returned home to the U.S.S.R. in disgrace. Spassky continued to play, winning several championships including the 1973 Soviet championship. In the 1974 Candidates matches, Spassky lost to the up and coming Anatoly Karpov in Leningrad, +1 -4. Karpov publicly acknowledged that Spassky was superior, but after a series of superb games, Karpov garnered enough points to take the match. Spassky�s later years showed a reluctance to totally devote himself to chess. He relied on a superb natural talent for the game, and sometimes would rather play a game of tennis, rather than work hard at the board. In effect, the 1972 World Championship and the 1974 Candidates match against Karpov signalled the end of Spassky�s pinnacle of success. Victor Korchnoi also overtook him. Spassky married a French woman in the 1970�s and became a French citizen in 1978. In 1992, Fischer, after a 20 year hiatus from chess, re-emerged to arrange a "Revenge Match of the 20th century" against Spassky in Montenegro and Belgrade—a re-enactment of the 1972 World Championship. At the time, Spassky was rated 106th in the FIDE rankings, and Fischer didn�t appear on the list at all (owing to his 20 year inactivity). This match was essentially Spassky�s last major challenge, and unfortunately health problems prevented him from putting up a credible performance except in a few games -- the result was +5 -10 =15. 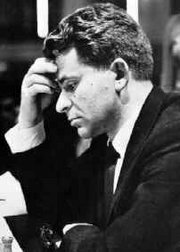 This article is based on the article Boris Spassky from the free encyclopaedia Wikipedia and stands under the GNU-Licence for free documentation. In the Wikipedia a list of the authors is available.